Comments: This large, Old World species has been found in North America since the 1950s in increasing numbers. Adults have slate-gray upperparts, black wing tips with white spots on the outer two primaries, yellow legs, yellow eyes and a yellow bill with a bright orange-red spot. First winter Herring Gulls can be mistaken for first winter Lesser Black-backed Gulls. Immature California Gulls can be confused with Lesser Black-backed Gulls. 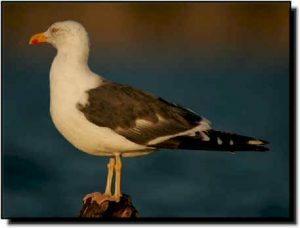 Lesser Black-backed Gulls occur in small numbers or are found only in localized sites within the Great Plains.